Here, you'll find the answers to email's persistent questions, and some insights into how the email tool works. Why is my query total higher than my sent email total? The query tool works as a selection process, pulling everyone who meets the criteria of the email blast. However, the blaster only loads those records with valid, active email addresses. Unsubscribes, inactive accounts, blank email addresses, and email addresses without proper formatting will not be loaded into the blaster. Why does my email to my Yahoo! account look different than the one to my Gmail account? E-mail clients vary in how they accept some formatting, especially in css. As a result, code that may be supported by Gmail, may not be supported by Yahoo!, Hotmail, Outlook, or Thunderbird. Send test messages to as many different email domains as possible to check for these problems. Why does the preview look different from my test email? The email preview will view the email in a web browser because code is viewed differently by different email providers. What may be valid code in a browser may look different in an actual email. Use test emails to confirm how your email will appear. I want to change my template for this blast. How do I do that? You can only switch from an UNeditable template to another UNeditable template. Go to the eblast, select another template, and click save and continue on both the template AND content pages. Why is my blast scheduled in the past? If you copy and recycled an earlier eblast, It will appear as being scheduled when you sent out or scheduled the original blast. It will still send out when you schedule it. How can I compare the effectiveness of my emails? Use the Summary Report to compare open, clickthrough, and conversion rates for each email. Why do emails to mobile device users have such a low open rate? In order to track the email, images must be downloaded when the supporter receives the email. Since most mobile devices receive email in text-only format, the images are not included, and the open is not counted in the Salsa database. Why are people receiving blank emails? Make sure you have checked on the validation page that your email content passed the Microsoft check, as Microsoft Word-generated code can lead to blank emails. Also check to make sure that you have included text-only content in this email blast. Why are images from my email not displaying? This can occur for a variety of reasons, but most often it has to do with the settings of the user's web browser (like Firefox, IE, Safari, Chrome), email client (like Outlook, Thunderbird, etc. ), email provider (likeYahoo!, Gmail, Hotmail), or any combination. These settings are always set by the user, but some combinations default to NOT display images. Consult your browser, email provider, or email client help to adjust these settings. Why is someone whose record is unsubscribed still receiving emails? The supporter is most likely subscribed using another email address that feeds into their original unsubscribed address. Check your records using search for supporters for any other records with the supporter's name, or similar email addresses. Why is my email sending out late? Salsa's email processors can sometimes be clogged due to volume, slowing delivery of emails. 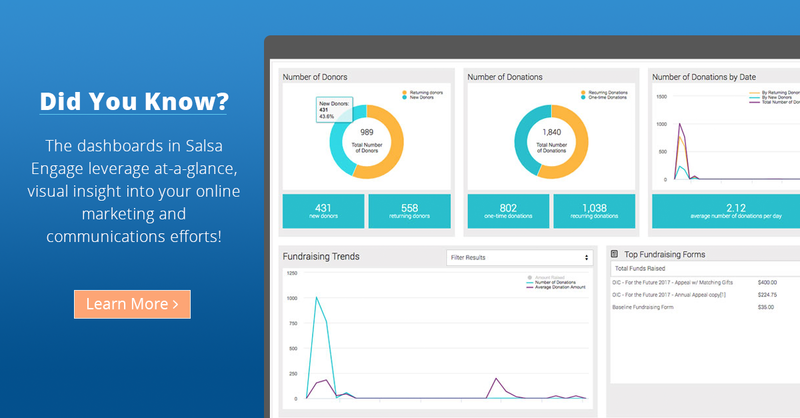 All Salsa contracts allow for a 3-hour window past the send time to complete sending an email blast. If your email blast is taking longer than this, please contact support. There may be elements in your email content causing a delay. Why have some targeted supporters not received the email when the email blast appears as Completed? "Completed" indicates that the email blast has completed sending from Salsa's email send servers. A supporters recipient email servers may delay delivery of an email to the supporter's inbox due to volume on the email recipient servers, errors in the html, or for spam filtering purposes. Is there a way to automate a welcome series for new sign ups? How do I add social media links to my email / email templates? To determine your node URL, read more here.